Be wild and funky with these graduation open house party invitations. Modern and sophisticated these personalized photo graduation invitations are perfect for any graduation event including middle school, high school and college. Easy to personalize with your photo and text using our template. Celebrate your event in style! 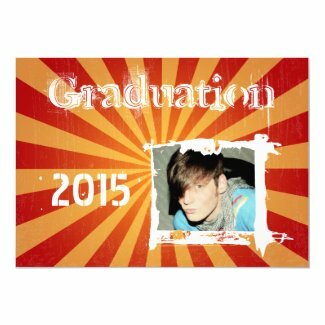 Funky Rad Grad Grunge Graduation Invitations Orange and red grunge radial pattern with fresh funky white grunge text. © 2015 Sublime Stationery All Rights Reserved 5 inches W and 7 inches L Each announcement comes with an envelope.